Our project consists of five important elements, each inherent to the design of a hydroponic system; a water/nutrient-solution delivery system, a plant/container storage array, the actual nutrients themselves, the growing medium, and of course the plants. What is a hydroponic system, you say? The basis of hydroponics — from English “hydro,” or “water,” and Greek “ponein,” “to labor or toil” — is to form a system of growing plants — usually herbs, or small vegetables, though most systems can be expanded past the small-scale — without conventional soil or growing medium. 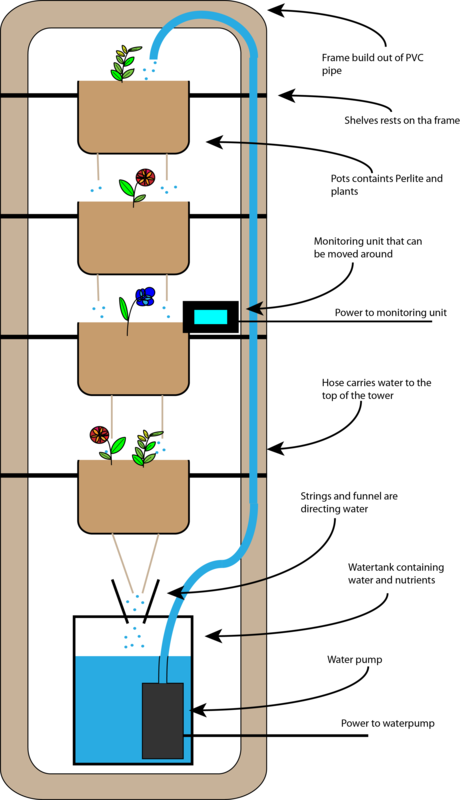 Most hydroponic systems involve the above components — the plants themselves, a container within which to hold the plants, a growing medium (usually with common growing mediums such as perlite, vermiculite, clay pebbles, or coconut husks), and a nutrient solution / pumping system to deliver the nutrients to the plants. Conventional soil acts as merely a buffer for the plants, protecting them from pH changes, water saturation, and other environmental changes — by removing the soil it is possible to deliver nutrients directly to the plants without having to enrich the soil first (e.g. with fertilizer), where the new growing medium merely contains the roots of the plants without absorbing the nutrients themselves. This is why most hydroponic systems, such as ours, are self-sustaining and automated; without the soil-buffer, every environment variable must be more carefully controlled to allow for the plants to still grow within their desired ranges.